�����Heritage Auctions just completed the sale of Part V of the Eric P. Newman Collection in New York this past week. As has been the case throughout the sale of this fantastic collection there were many extraordinary coins that found new homes with ecstatic owners. Among the many rarities sold were some early coins we normally do not report. They include the 1776 Continental Dollar, CURENCY, Brass NGC MS62; this coin brought $440,625. Another 1776 Continental Dollar, CURRENCEY, Pewter NGC MS63 sold for $381,875. Both of these coins had the CAC sticker which no doubt helped in adding premiums to the final prices realized. There were several more high value Colonials that attracted very aggressive bidding. These and all prices realized can be obtained directly from Heritage Auctions. �����Below is a list of some other highlights from this important sale, including many coins that qualified for the CAC sticker. These Certified Acceptance Corporation verified coins, especially when they are rarities, continue to attract premium bids. �����The metals made a nice recovery at the end of last week, and so far today have not lost much of the gains. Gold is currently at $1,185.50 and Silver is $16.14. One ounce Proof Gold Eagles in the OGP are trading at $1,385 and Proof Silver Eagles are at $48. Ninety percent Silver bags are wholesaling at $12,765 and bags of VG Silver Dollars are at $23,400. 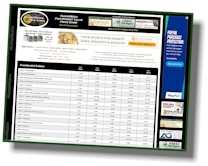 �����In this week�s Wholesale Market Dealer Price Guide you will notice increases in most charts. 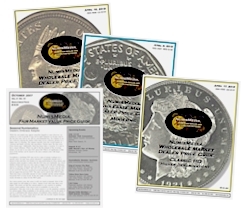 There are numerous advances in the Half Cent and Large Cent charts as buyers have been locating a variety of rarities in auctions or dealer sell lists. The 1796 with Pole Half Cent is higher in MS60 and MS61 with the latter being $125,000 Market. The 1846 PR66 Brown Restrike is up to $10,850 and the 1847 PR65 Red & Brown Restrike is now $9,350. �����In the Large Cents chart the 1794 �Head of 1794� Brown in MS64 rose to $41,500, the 1794 �Head of 1795� in MS63 Brown climbed to $19,500, and the 1796 Liberty Cap in MS64 Brown jumped to $63,500 Market. 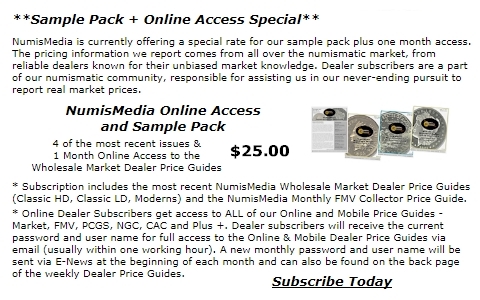 When any of these specialty coins come onto the market the advanced collectors become very competitive. When they are some of the highest grades known for the date, you can be certain that records will be broken.